Looking for the best productivity and collaboration software? We’re here to help. Finding the right kind of productivity software to fit your needs is kind of like buying a new pair of jeans. There are tons of styles to choose from, but you have to find a brand and cut that fits you just right (and makes you feel good when you put them on). The process can be overwhelming, and sometimes you just need a friend there to help you make a good decision. That’s why we’re here – to make sure you know what to look for when it’s time to go shopping. 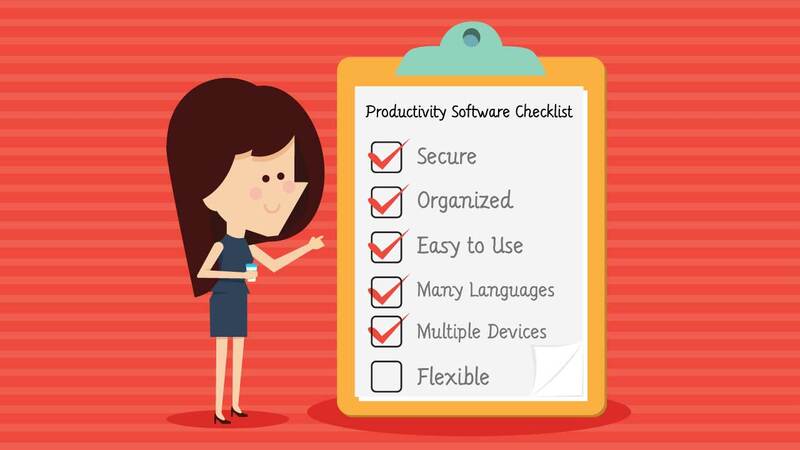 So first things first: what exactly is productivity software? In the most simple form, it’s a collection of tools that helps individuals or teams, well … be more productive. You know, like spreadsheets and databases or file-sharing and chat access. And ideally, it’ll help improve team interaction and allow organizations to be more collaborative, and therefore more successful. Work on multiple projects in one single place. Make data accessible only by the organization members you specify. Keep sensitive or private files (like billing and expenses) secure. Manage your volume of email, and stay connected and up-to-date on specific activities easily, without having to sort through random and unrelated notices. Bundle notifications, meaning that you can receive one email for multiple actions happening at the same time. Integrate with all the other tools you use. Sort updates by relevancy, so you’ll receive a notice on any action that concerns you directly. Create and respond to tasks and conversations directly from the program and/or your email. Utilize appropriate project management tools, simplified notifications, subject line prefixes and task descriptions. Easily organize teams and projects to ensure visibility and accountability, enabling your group to get more accomplished. Create as many projects as necessary with a flexible structure that lets you work the way you want. Manage conversations, notes and files that go along with a specific task or group. Instantly see progress and milestones with a workload view, milestone calendar and streamlined charting. Easily share, find and work on current documents. Utilize free file storage and integration with Dropbox, Box, Google Drive and more. Organize and store team communication by project in a spam-free environment. Easily convert discussions to tasks. Use HD Video conferencing, screen sharing, and group chat to communicate with your team in real time. Stay connected with multiple devices and mobile applications. Have access to multiple language supports. Once you find the productivity software that appeals to you and your individual or company needs, make sure you can try it on, so to speak, in the form of a trial period. You’ll be able to get a good sense of the program – and if it’s the “right fit” – only from using it in real-time, with real projects.